St Joseph’s is located on the corner of Kenrick and Farquhar Streets, The Junction. St Joseph’s Church is a large, modern church that is the second church of that name to stand on the present site. It is the home to many long-term Parishioners and is the spiritual home of numerous groups active in the life of St Benedict’s Parish. There is a Columbarium adjacent to the entry to St Joseph’s Church, with niches for the ashes of deceased Parishioners and others with a strong connection to St Joseph’s. The St Benedict’s Centre (formerly known as the City Region Catholic Centre, and more formerly the St Joseph’s Convent) stands next to the Church, is a great resource for the whole Parish and is well used for group meetings and the administrative centre for St Benedict’s Parish. St Joseph’s in The Junction is part of the present Newcastle Parish which dates from the establishment of St Mary’s Star of the Sea in 1838. In 1891 a new Parish, the Parish of Burwood, was established based at St Joseph’s in The Junction. The Parish of Burwood extended from Parry Street, Cooks Hill to the shores of Lake Macquarie and included the Adamstown, Charlestown, Dudley, Redhead, Gateshead, Kahibah, Bar Beach, and Merewether areas. The area of the Burwood Parish reduced progressively as new Parishes were established at Adamstown (1925), which included the Charlestown Dudley, Redhead, Gateshead and Kahibah areas, and at Merewether Beach (1939). 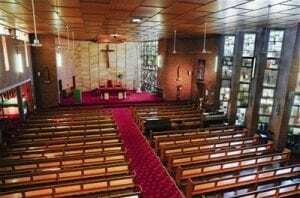 Since 1960, three churches were built, consecrated and subsequently closed within the present Newcastle Parish area. Of these, St Martin’s at Hamilton Hamilton South (1966 to 1993) and St Luke’s in Cooks Hill (1962 to 2003) were part of the Merewether Parish based at St Joseph’s, The Junction. St Mark’s in the Newcastle CBD (1970 to 2007) was built, owned and operated by the Diocese chiefly for the benefit of Catholics working in the Newcastle City CBD area. Bishop Michael Malone formed the present Newcastle Parish on 1 July 1997. Until then, there were three separate Parishes – Newcastle Parish (based at St Mary’s Star of the Sea Church), Merewether Parish (based at St Joseph’s Church) and Merewether Beach Parish (based at the former Holy Family Church).